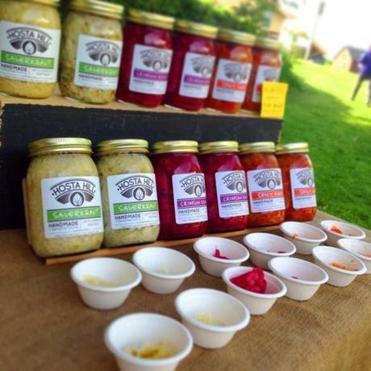 Hosta Hill’s line of lacto-fermented vegetables at a farmers’ market. All of which might not matter if the stuff didn’t taste great, too. Hosta Hill’s sauerkraut is tart and crisp; the kimchi has a bright freshness that sets it apart from other jarred versions. The product line ($7-$8) also includes a curry kraut, a lacto-fermented hot sauce, and a few variants on “krautonic,” the briny juice created during the fermentation process. (Some of these might not quite work as beverages, but they can add a shot of fermented flavor to soups, salad dressings, sauces, and more.) No vinegar is involved; the tang is because of the lactic acid.